Indie Super-Star (and all around awesome person) Susan Kaye Quinn writes some of my favorite sci-fi books ever. So when I heard she was coming out with a steampunk fantasy romance, I may have done a little dance in my writing chair. THIRD DAUGHTER is out today and I’ve already rushed over to get my copy. Take a look at the blurb below – sounds fantastic, right? And I LOVE the cover! Yay for diversity – an east-indian alternate world? Sign me up!!! I can’t wait to dive into this one! 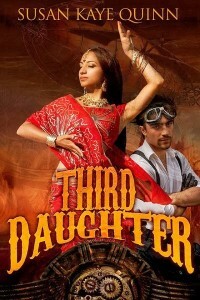 Third Daughter (Dharian Affairs #1) The Third Daughter of the Queen wants to her birthday to arrive so she’ll be free to marry for love, but rumors of a new flying weapon may force her to accept a barbarian prince’s proposal for a peace-brokering marriage. Desperate to marry the charming courtesan she loves, Aniri agrees to the prince’s proposal as a subterfuge in order to spy on him, find the weapon, and hopefully avoid both war and an arranged marriage to a man she does not love. If it sounds like something you’d like to check out, you can add it to Goodreads.